As a client you can use OneLogin for SSO on Teamie. You can find the Teamie app in the OneLogin app catalog, configure the SSO as per your requirement and provide access to your users to login to Teamie via OneLogin SSO. 1. Access https://www.onelogin.com/ and login to OneLogin using your admin credentials. You would have to enter your company's OneLogin Domain and then your Username and Password to complete your login. 2. Hover over APPS and select Add Apps from the top navigation bar. 3. Enter Teamie in the search bar, press enter and select Teamie. Alternatively, you can click the Education category and choose Teamie. 4. Clicking Teamie will take you to the initial configuration page. 1. 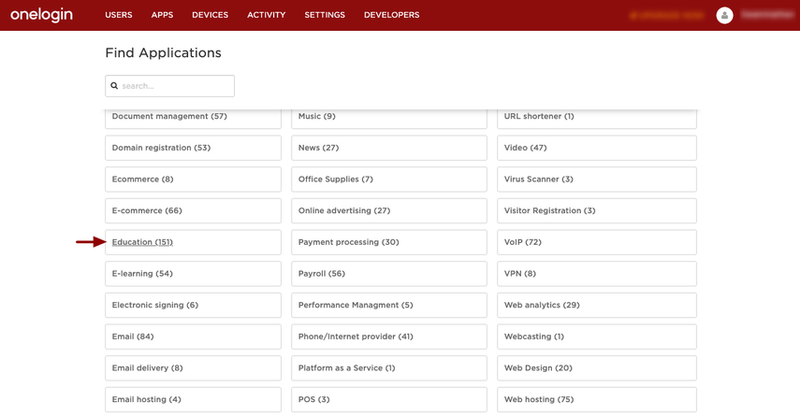 Access Teamie app from the OneLogin app catalog. 2. 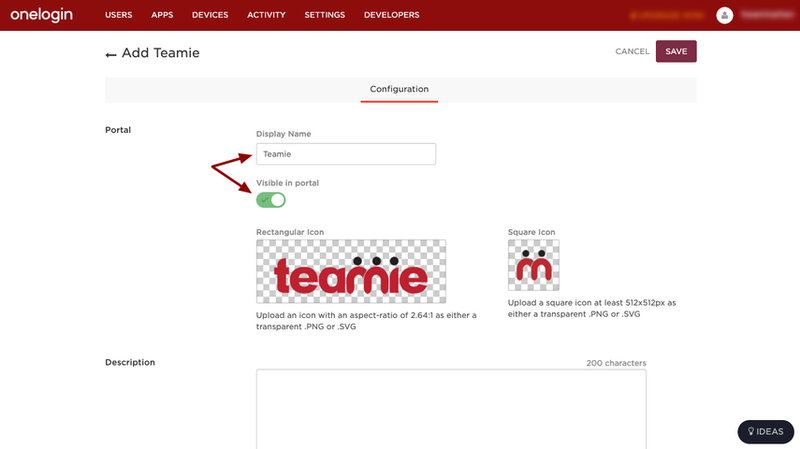 On the initial configuration page, enter Teamie under the Display Name. Also, make sure “Visible in Portal” setting is enabled. You can change the display name as per your requirement. 3. Upload the rectangular and square icon for the app by uploading the required logo image. You can also add the description for the app as per your requirement. 4. Click Save to save the initial configuration. 5. Click the Configuration tab to access the detailed configurations. 6. On the detailed Configurations tab, enter the following fields. 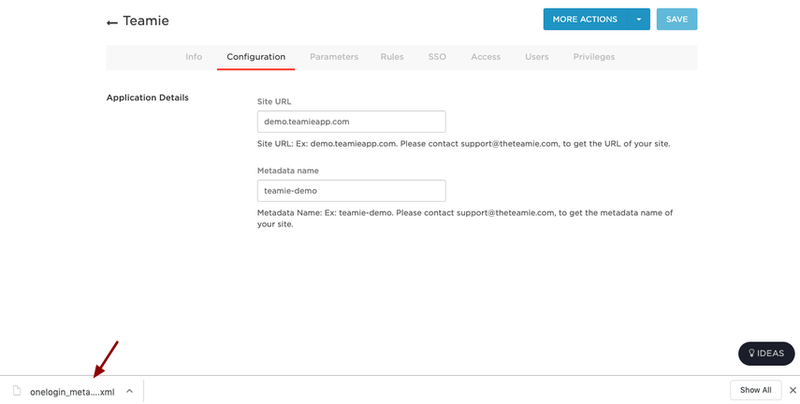 The 'Site URL' and 'Metadata name' will be provided to you by Teamie. 7. Click Save. A confirmation message will appear to confirm that the changes were saved. 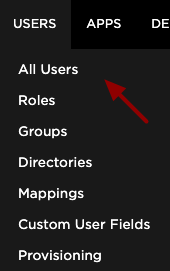 All other fields in remaining tabs are pre configured and you don't have to make any changes in them. 8. On the Access tab, assign the OneLogin roles that should have access to Teamie and provide any app security policy that you want to apply to Teamie. You can also go to Users page to add the app to individual user accounts, and return to this app configuration page to complete SSO configuration. 1. 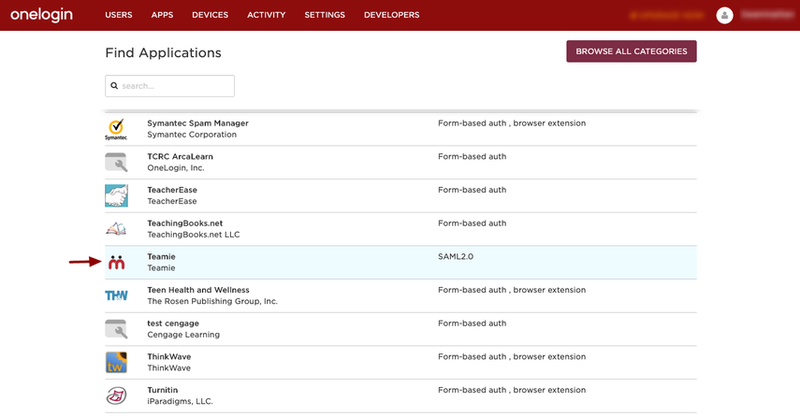 Hover over More Actions and select SAML Metadata to download the XML file. Share this file with us at Teamie so that we can complete the configuration from our end.